Fidget Spinners: What are they all about? Easily distracted? Feeling emotionally stressed and anxious? A Fidget Spinner may help you. Originally invented in the 1990’s these stress-relieving toys have become the latest craze in 2017. In short, they may help to release nervous energy in those who have anxiety problems, ADHD, autism and general stress. How to get one? You can easily get hold of one on Amazon by clicking here. 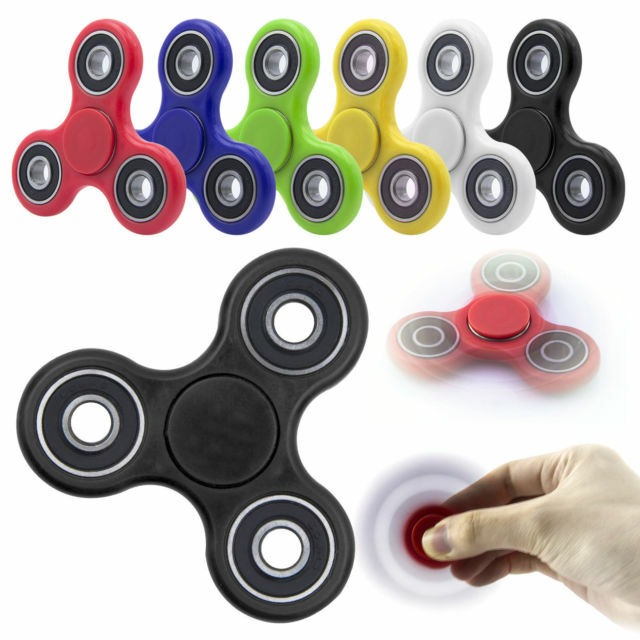 Fidget spinners are often designed with the intent to relieve stress, and they’re perfect for anyone who just likes to fidget! Basic fidget spinners have a two- or three-pronged design with a bearing in the circular centre pad. To make them spin, you simply hold the centre pad and give the prongs a spin. Fidget Spinners are made from various types of material, including brass, stainless steel, titanium, copper, aluminum, and 3D printed plastic. The bearings are usually ceramic, stainless steel or chrome, but some have hybrid designs. Catherine Hettinger, a chemical engineer by training, was initially credited by some newspapers to have been the inventor of the fidget spinner, including The Guardian, The New York Times and the New York Post. Hettinger told the New York Post that the idea for the toy came as she saw young boys throwing rocks at police officers in Israel – she wanted to develop a soothing toy that could help children release pent-up energy and “promote peace”. However, she told The Guardian that the origins of the fidget spinner came when she was suffering from an autoimmune disorder that causes muscle weakness. Unable to play with her daughter, she started “throwing things together with newspaper and tape” in an effort to entertain her. Whatever the inspiration, the toy soon gained popularity as she began small-scale manufacturing from her home and sold her invention at art fairs. After applying for a patent on May 28, 1993, Hettinger pitched her spinner device to toy manufacturers. After market testing it, Hasbro declined to pursue a deal. Hettinger let the patent lapse in 2005. Had been maintained, it would have expired in 2014. Read more on the Fidget Spinner here. You can read even more about them on the main Figdet Spinner website here. Again, you can easily hold of one on Amazon by clicking here. ← What is the new Citymapper Smartbus all about?